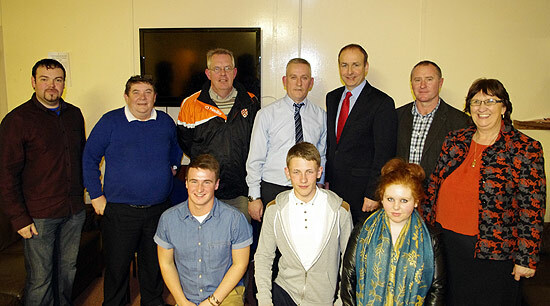 On Thursday 28th February 2013, young people, staff, volunteers and management of Clann Eireann Youth Club were pleased to welcome Mr Micheal Martin T.D. Leader of Fianna Fail to the Shore Road. 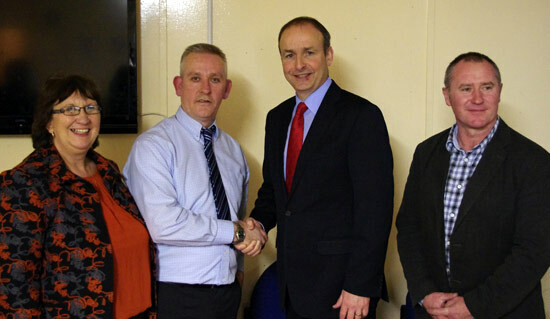 Michael was joined on his visit by local MLA Delores Kelly SDLP and Brendan Smith (FF) T.D. Cavan-Monaghan. The purpose of the visit was to engage with Clann Eireann Youth Club and gain an insight and understanding into the community issues of the local area of North Lurgan and the positive interventions Clann Eireann Youth Club are putting in place in response to community needs. During his visit the Cork TD and former Foreign Secretary spoke to young people who have taken part in Community Relations programmes with Lurgan Youth Annexe Mournview, such programming funded by The Dept of Foreign Affairs and Trade (DFA) in Dublin. The Nemo Rangers man was given a summary of the clubs development and historical youth provision within the local area. He was informed by staff of the positive impact funding from both DFA Dublin and Peace 3 Neighbourhood Renewal had, in providing additional learning opportunities for young people through Community Relations and Detached Youth Work Programmes which included engaging with marginalised young people. In his role as Leader of Fianna Fail and as an experienced parliamentarian he assured us of his commitment to us a club, to the young people of north Lurgan and to continue to lobby for funding to assist us in dealing with youth and community issues in north Lurgan. The young people present were able to give Michael Martin face to face testimony on how taking part in our club programming funded by DFA had provided them with opportunities for positive engagement and learning outcomes. Clann Eireann Youth Club would like to express our thanks to all of those involved and in particular Mrs D Kelly MLA and her staff for organising such a visit.